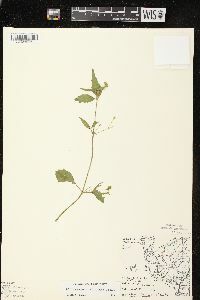 Plants 8-62 cm. Leaf blades 20-60 × 15-45 mm. Peduncles 5-20 mm. Involucres hemispheric to campanulate, 3-6 mm diam. Phyllaries falling. Paleae: outer falling, broadly elliptic to obovate, 2-3 mm; inner falling, linear to lanceolate, 2-3 mm, entire or 2- or 3-lobed, lobes to 1/3 total lengths, blunt. Ray florets (4-)5(-8); corollas usually white, sometimes pink, laminae 0.9-2.5 × 0.9-2 mm. Disc florets 15-35. Cypselae: rays 1.5-2 mm; discs 1.3-1.8 mm; pappi: rays of 6-15 fimbriate scales 0.5-1 mm; discs 0, or of usually 14-20, rarely 1-5, white, lanceolate to oblanceolate, fimbriate, sometimes aristate, scales 0.2-1.7 mm. 2n = 32 [48, 64]. Flowering and fruiting summer-fall. Disturbed soils, fields, orchards, gardens, lawns, roadsides; 0-2500 m; introduced; Alta., B.C., Man., N.B., N.S., Ont., P.E.I., Que., Sask. ; Ala., Ark., Colo., Conn., Del., D.C., Fla., Ga., Ill., Ind., Iowa, Kans., Ky., Maine, Md., Mass., Mich., Minn., Mo., Nebr., N.H., N.J., N.Y., N.C., N.Dak., Ohio, Pa., R.I., S.C., Tenn., Vt., Va., Wash., W.Va., Wis.; Mexico; West Indies; Central America; South America; introduced in Europe; Asia; Africa; Pacific Islands. Tetraploids of Galinsoga quadriradiata are native to Mexico. 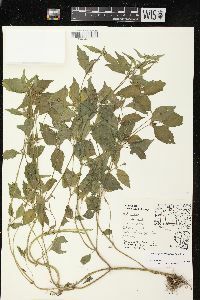 Higher polyploids are found in South America and differ from the tetraploids by their coarsely crenate-serrate leaves, cylindro-campanulate involucres, and usually reddish purple limbs of ray corollas that extend at right angles to involucres. 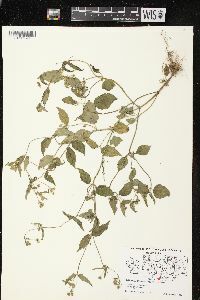 This pernicious weed was first reported in 1911 from Putnam and Ripley Counties. Since that time it has been discovered in several other counties. 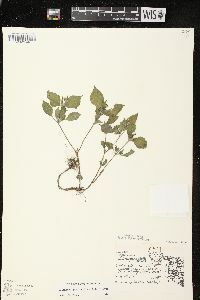 It is probably found in cultivated fields in every county along the Ohio River. 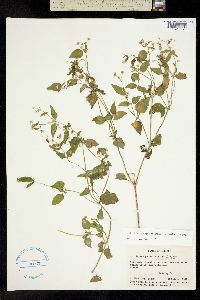 I found it to be a common weed in the park and adjacent lots in Rushville, Rush County, in 1925. This weed will, no doubt, eventually become a pest in all parts of the state.